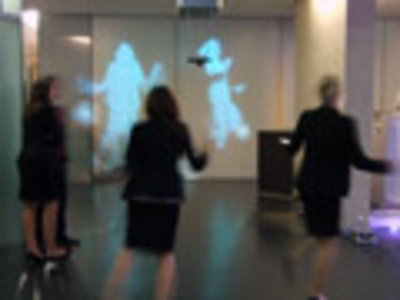 At an event for UniCredit the guest had the possibility to interact in interactive games and projections. You could practice yourself in penatly, or duel one against one. An special highlight for the guest are that their dance moves are directly projected at the walls around them. Additional to these mirrored effect the guest hand to possibility to juggle with interactive balls.